Showing results for tags 'golf gti'. Worthersee is a huge show for both VW and its fans alike, the Austrian festival the perfect place to celebrate Volkswagens old and new. You’ll hopefully be familiar with the apprentice-built concepts at each gathering too – see last year’s GTI Heartbeat, for example – and 2017 is no different: welcome to the Golf GTI First Decade. The name signifies the fact that apprentices have been building Worthersee GTI concepts for 10 years, but it’s far more interesting than just that. Why? This is the first GTI with electric propulsion. Don’t worry, it’s not an EV GTI, instead a hybrid version that uses a 410hp petrol engine for the front wheels – a brave enough move already, you would think – combined with a 48-volt electric motor for the rear wheels with a maximum output of 16hp. Certainly a mild hybrid then. The First Decade car can be run as front-wheel drive only – that’s what we meant about brave – as an all-wheel drive hybrid or in EV, rear-wheel drive mode. Don’t go getting carried away with that 16hp now. Joking aside, the electric mode is there for short urban journeys or stop-start traffic; the batteries are then charged through regenerative braking the rest of the time. The drive modes are selected via the infotainment display. 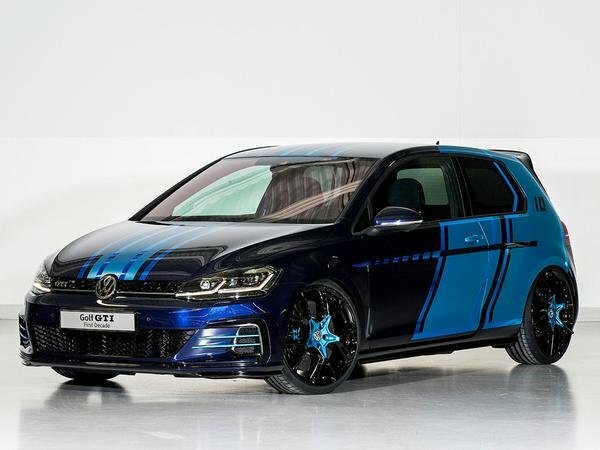 Just in case there wasn't enough blue... How close are we to a hybrid GTI? It doesn’t sound all that far off, VW’s Head of Automotive Technology Training Peter Christ saying the project means “our apprentices learn about the complexity and future challenges of automobile production.” Could these apprentices be working on the production car in just a few years time? Hopefully they will have grown out of their young people design tastes by then, at least. The GTI First Decade features Atlantic Blue paint with ‘Satin Ocean Shimmer’ foil as a contrast. There are rally stripes in three shades of blue and the 20-inch wheels are from mb-Design. And inside, being young people, there are 11 loudspeakers, a subwoofer and 1,690 watts of sound system power. Sick. As always, this apprentice concept is not a Golf for production. It does seem to preview upcoming GTI features though – and not just the 20-inch wheels – which could be along even sooner than you may think.